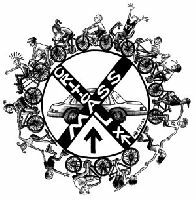 Cyclists, artists, media activists, writers unite! Document and contribute to the growing movement. On September 1, a social strike (or fare strike) begins to combat MUNI fare hikes, service cuts, and layoffs. Riders won't pay, and drivers won't collect. The strike will last, and it will spread, until 3 demands are met: the fare is reduceed back to $1.25, all service cuts are reversed, and drivers who were laid off are rehired. The best Midnight Mystery Bike Ride ever. Monthly face-off between bicyclists and City continues. Mobility-rights watchdog launches international campaign to stop arrests of cyclists in New York City.